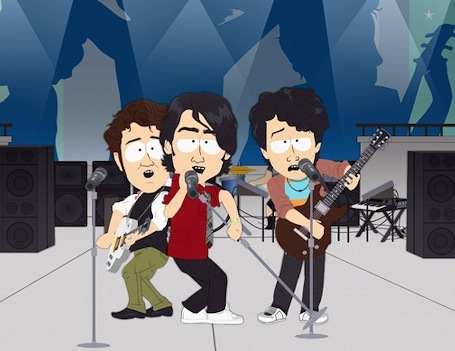 South Park draws up the Jonas Brothers on Season 13 premiere. The Jonas Brothers' carefully choreographed sales trip through a blizzard of network TV shows will be waylaid Wednesday when South Park has at 'em. In the series' 13th season premiere (Wednesday, March 11th, 9 p.m central), Kenny takes his girlfriend to a Jonas Brothers concert in hopes that it's "his way into her heart and other body parts," says a Comedy Central publicity release. Instead his dream "is crushed" when the boys give them purity rings. ***CBS has concocted a one-hour April Fool's Day special, I Get That A Lot, featuring various celebs punking innocent commoners. Among them is Jessica Simpson, who slums as a computer repair store worker. Hilarity ensues, says CBS, as "these celebrity jesters continue to deny their true identities." Also included: Heidi Klum slinging pizzas, LeAnn Rimes waitressing at a Nashville diner and Ice-T selling shoes. ***Former Spin City star Michael J. Fox will return to ABC on May 7th in a one-hour special titled Michael J. Fox: Adventures of An Incurable Optimist. Fox, who was diagnosed with Parkinson's Disease in 1998, will introduce viewers to "a variety of people who haven't let difficulties stand in the way of their happiness," ABC says in a publicity release. Fox adds, "Sure, it may be one step forward and two steps back, but after a time with Parkinson's, I've learned that what is important is making that one step count."